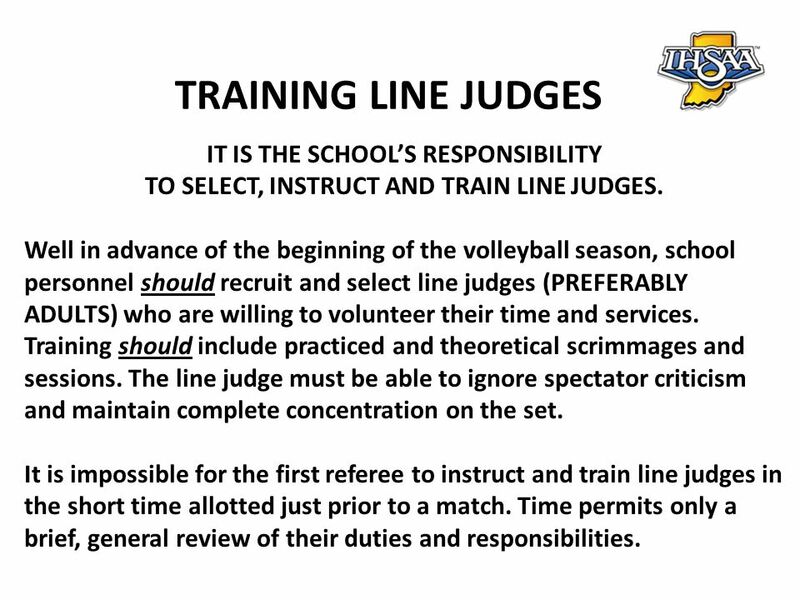 TO SELECT, INSTRUCT AND TRAIN LINE JUDGES. 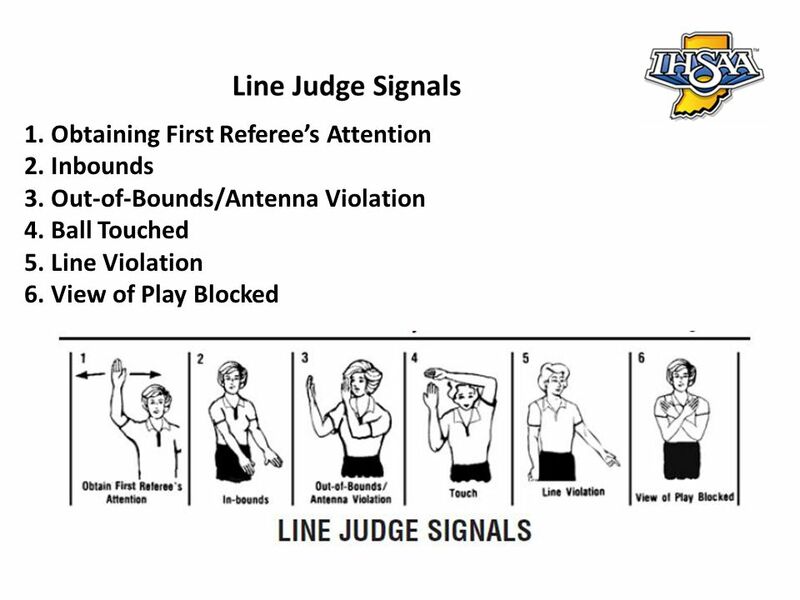 Well in advance of the beginning of the volleyball season, school personnel should recruit and select line judges (PREFERABLY ADULTS) who are willing to volunteer their time and services. Training should include practiced and theoretical scrimmages and sessions. The line judge must be able to ignore spectator criticism and maintain complete concentration on the set. It is impossible for the first referee to instruct and train line judges in the short time allotted just prior to a match. Time permits only a brief, general review of their duties and responsibilities. Regular Season – The host school is responsible for insuring that line judges are available for each match. 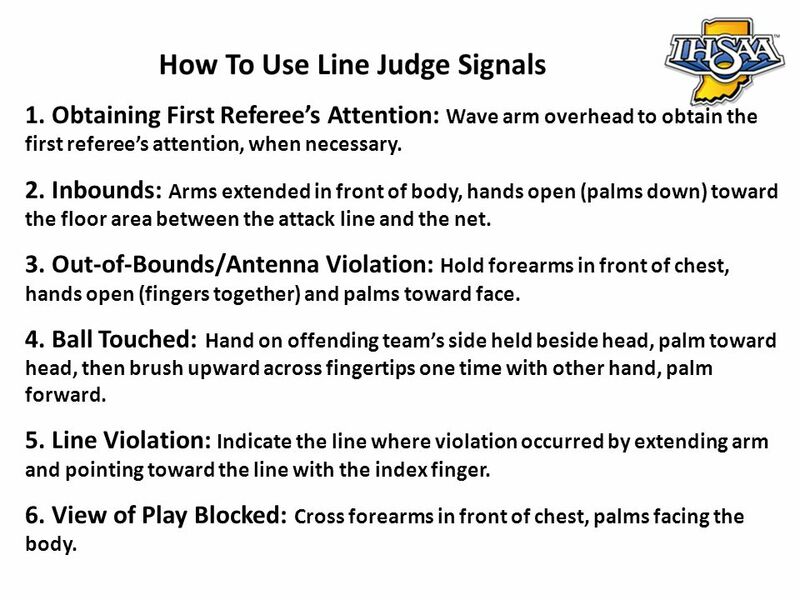 The use of adult line judges is preferred, but student line judges may be used during the season. 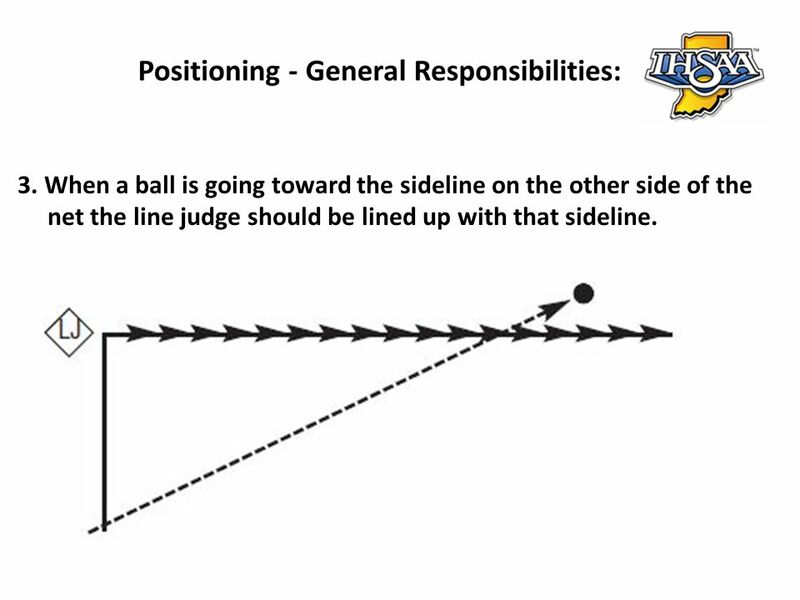 Schools should provided proper training for all individuals performing line judge duties. 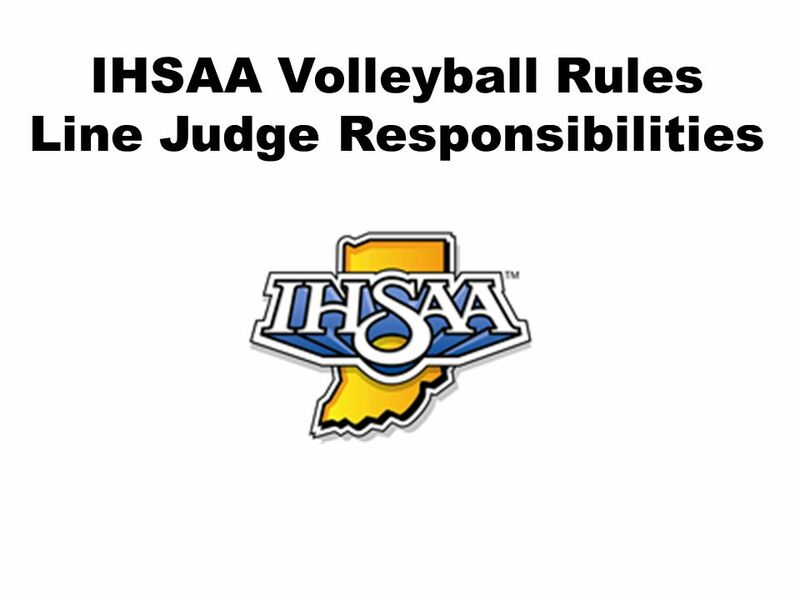 Tournament Series – Sectional, Regional, and Semi-State hosts will select line judges. 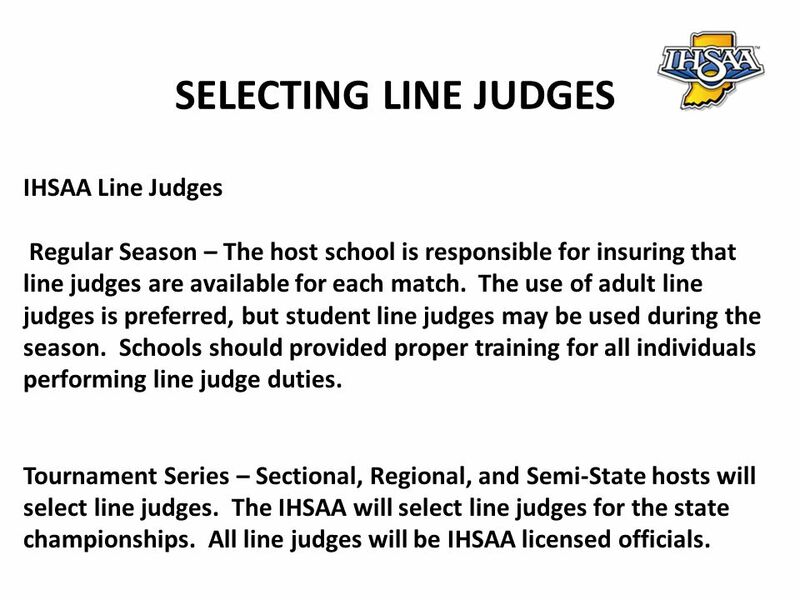 The IHSAA will select line judges for the state championships. 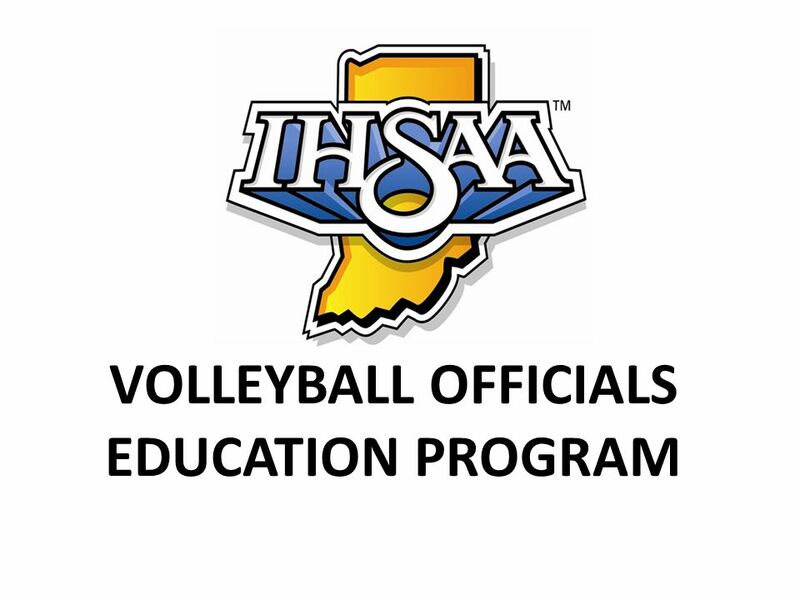 All line judges will be IHSAA licensed officials. 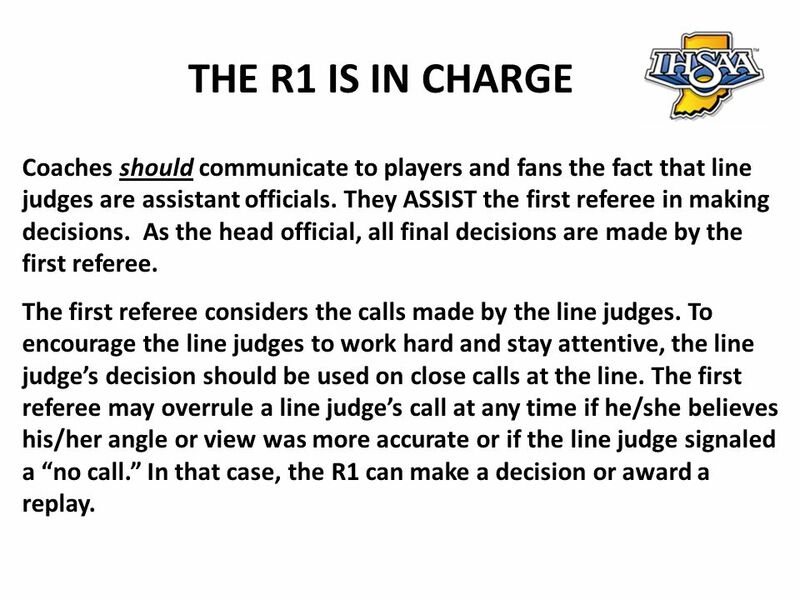 5 THE R1 IS IN CHARGE Coaches should communicate to players and fans the fact that line judges are assistant officials. They ASSIST the first referee in making decisions. As the head official, all final decisions are made by the first referee. The first referee considers the calls made by the line judges. To encourage the line judges to work hard and stay attentive, the line judge’s decision should be used on close calls at the line. The first referee may overrule a line judge’s call at any time if he/she believes his/her angle or view was more accurate or if the line judge signaled a “no call.” In that case, the R1 can make a decision or award a replay. 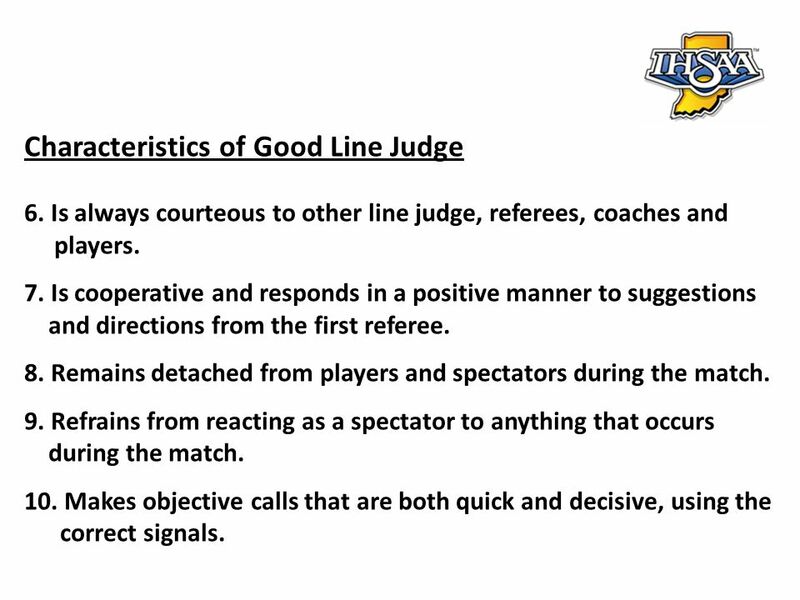 6 When dealing with line judges provided by the schools, the match officials must evaluate the experience level of the line judges and make every effort to utilize the line judges’ abilities so that the match is conducted fairly. 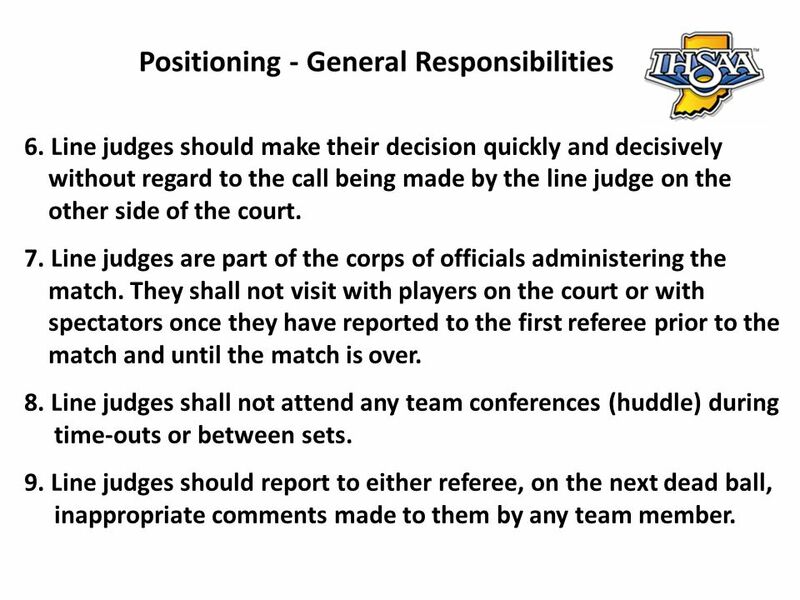 If multiple line judges are going to occupy the same position during a match, all of them must attend the pre-match meeting conducted by the match officials. 1. Reports to the first referee no less than 20 minutes before the scheduled starting time of the match. 2. Reports promptly to the pre-match meeting with the referees. 3. Is properly instructed and trained in all duties and responsibilities. 4. Performs duties in a confident, quiet, efficient manner. 5. Is appropriately dressed. 6. Is always courteous to other line judge, referees, coaches and players. 7. Is cooperative and responds in a positive manner to suggestions and directions from the first referee. 8. Remains detached from players and spectators during the match. 9. Refrains from reacting as a spectator to anything that occurs during the match. 10. Makes objective calls that are both quick and decisive, using the correct signals. 11. Concentrates on duties and responsibilities without being distracted by other people. 12. Is always alert and ready to move quickly into the best position to make a call without interfering with play. 13. Shows respect for the calls of other line judge. 14. Shows respect for and accepts, without question, all decisions of the first referee. 10 1. Line judges are assigned their positions by the first referee. 2. 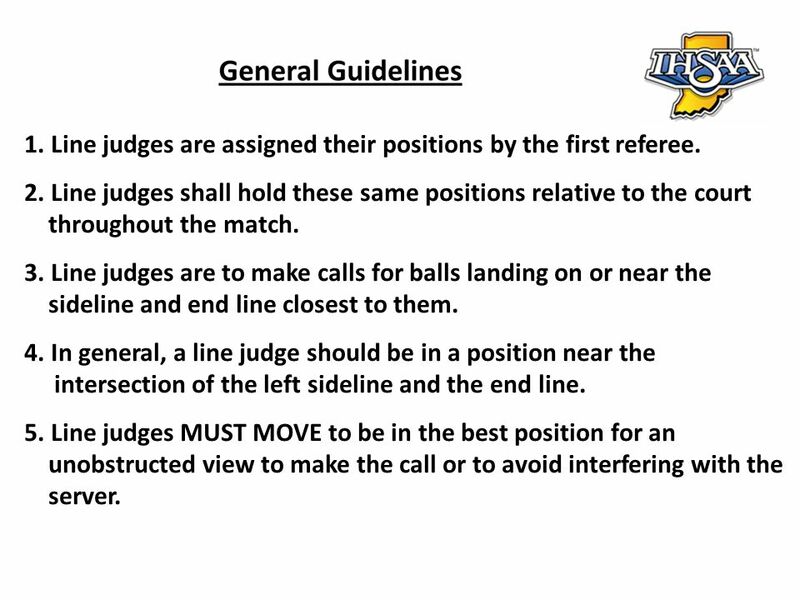 Line judges shall hold these same positions relative to the court throughout the match. 3. Line judges are to make calls for balls landing on or near the sideline and end line closest to them. 4. In general, a line judge should be in a position near the intersection of the left sideline and the end line. 5. 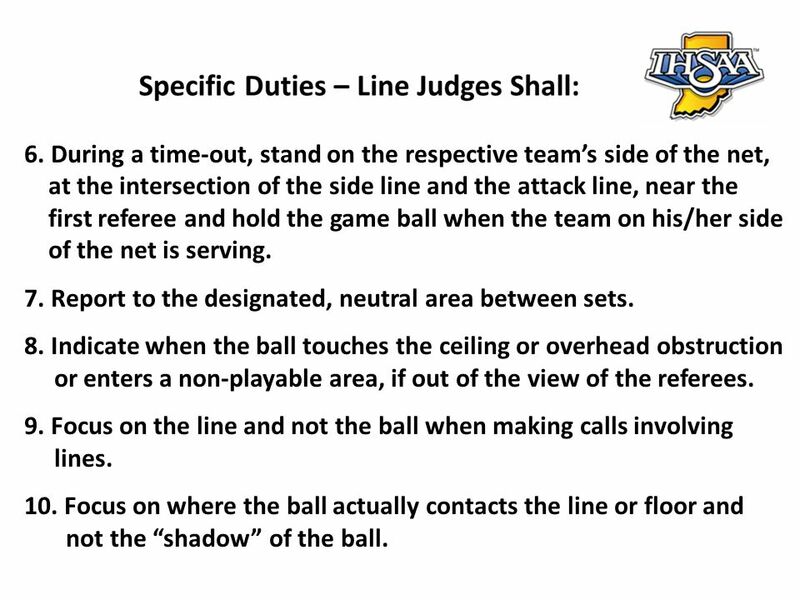 Line judges MUST MOVE to be in the best position for an unobstructed view to make the call or to avoid interfering with the server. 11 GENERAL GUIDELINES 6. On a ball landing in a corner opposite both line judges, both should make the call. An “out” call by either line judge would warrant an “out” call by the referee. 7. Line judges never enter the playing area. 8. Line judges must be alert to avoid being struck by the ball or interfering with a player’s opportunity to make a play. 9. The use of flags is optional as set forth by the state association. 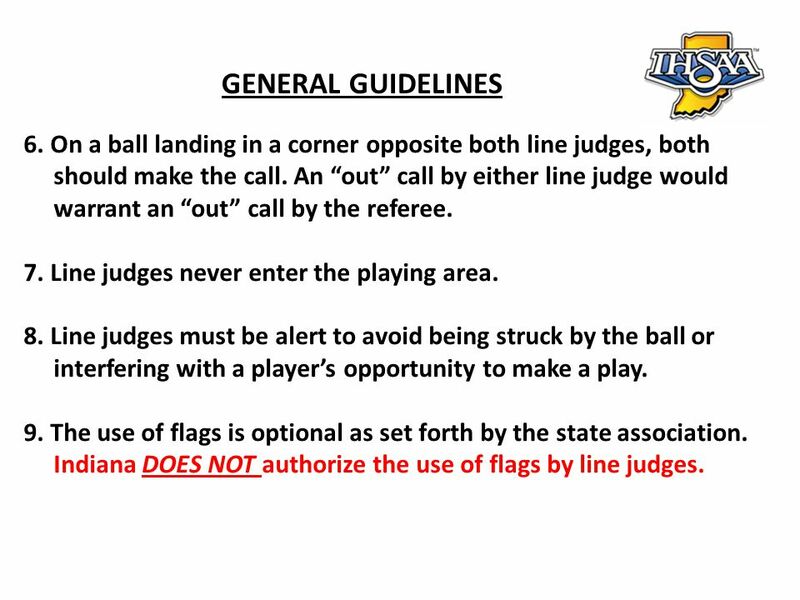 Indiana DOES NOT authorize the use of flags by line judges. 1. 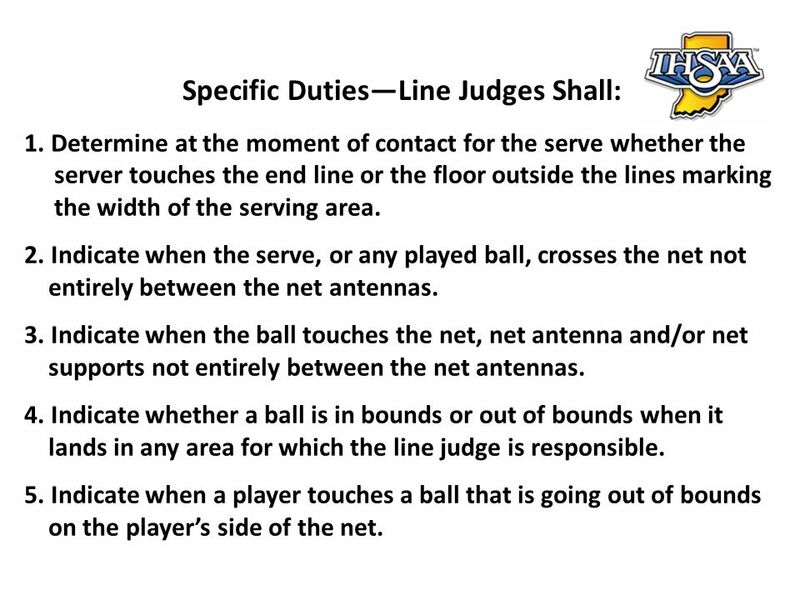 Determine at the moment of contact for the serve whether the server touches the end line or the floor outside the lines marking the width of the serving area. 2. 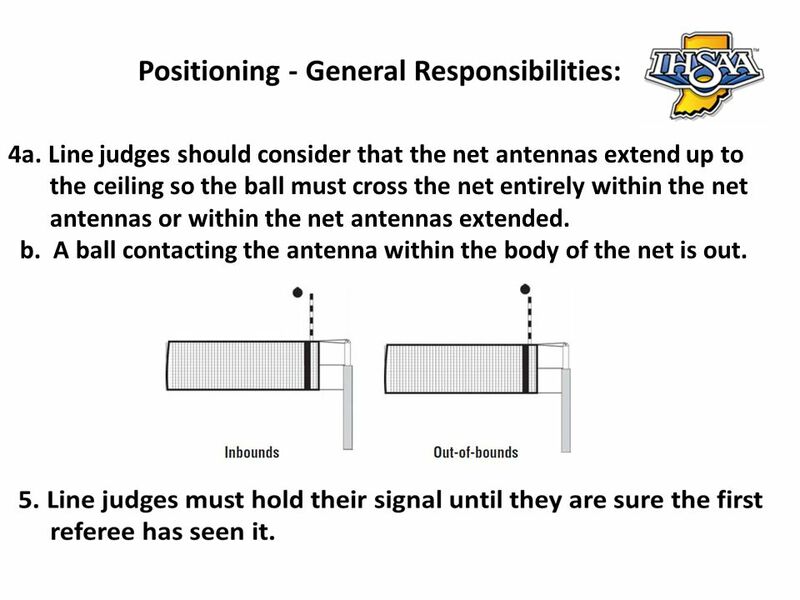 Indicate when the serve, or any played ball, crosses the net not entirely between the net antennas. 3. Indicate when the ball touches the net, net antenna and/or net supports not entirely between the net antennas. 4. 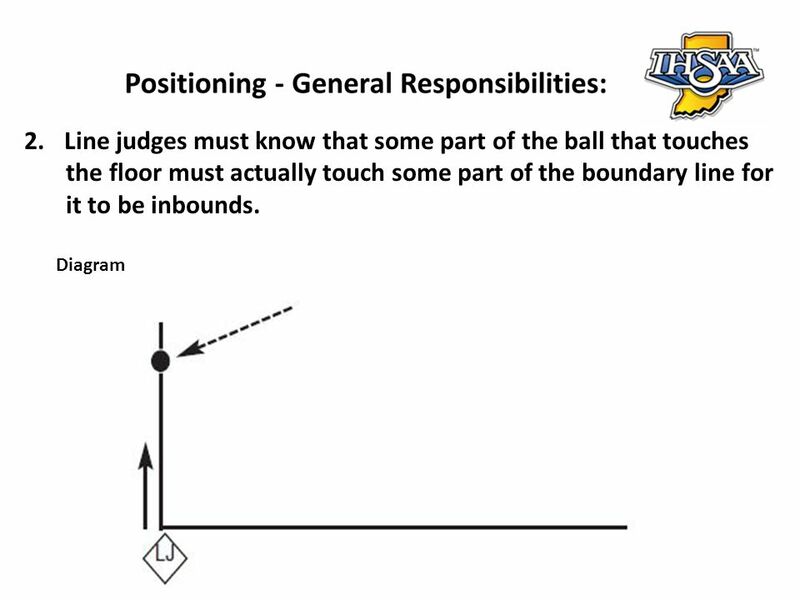 Indicate whether a ball is in bounds or out of bounds when it lands in any area for which the line judge is responsible. 5. Indicate when a player touches a ball that is going out of bounds on the player’s side of the net. at the intersection of the side line and the attack line, near the first referee and hold the game ball when the team on his/her side of the net is serving. 7. Report to the designated, neutral area between sets. 8. Indicate when the ball touches the ceiling or overhead obstruction or enters a non-playable area, if out of the view of the referees. 9. 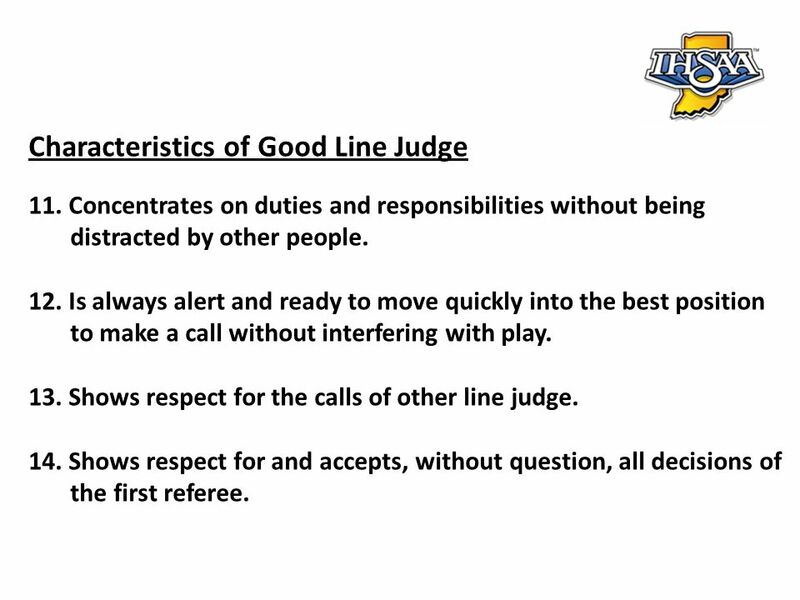 Focus on the line and not the ball when making calls involving lines. 10. Focus on where the ball actually contacts the line or floor and not the “shadow” of the ball. 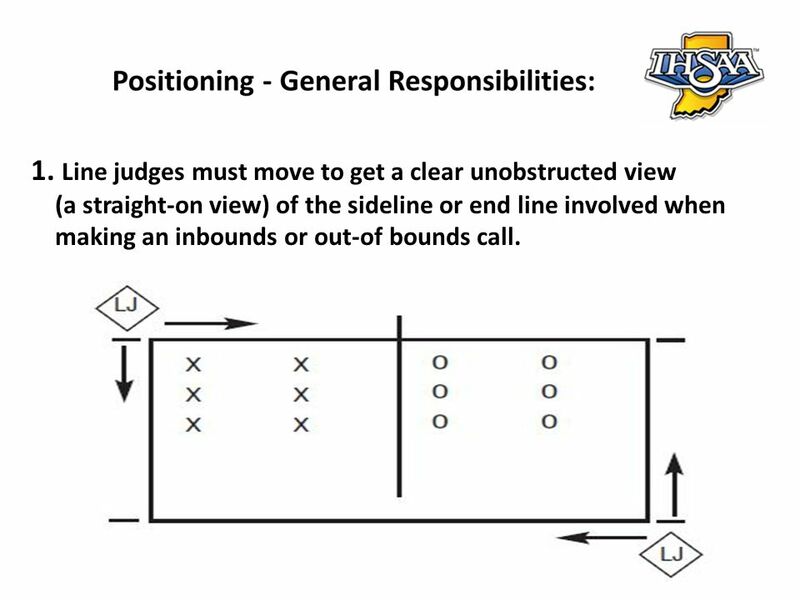 (a straight-on view) of the sideline or end line involved when making an inbounds or out-of bounds call. net the line judge should be lined up with that sideline. the ceiling so the ball must cross the net entirely within the net antennas or within the net antennas extended. b. A ball contacting the antenna within the body of the net is out. without regard to the call being made by the line judge on the other side of the court. 7. Line judges are part of the corps of officials administering the match. They shall not visit with players on the court or with spectators once they have reported to the first referee prior to the match and until the match is over. 8. Line judges shall not attend any team conferences (huddle) during time-outs or between sets. 9. Line judges should report to either referee, on the next dead ball, inappropriate comments made to them by any team member. 19 1. 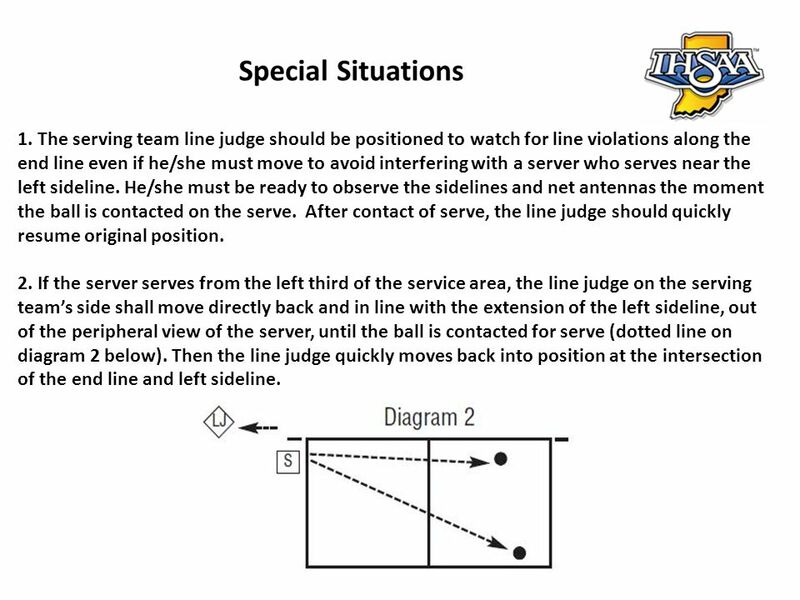 The serving team line judge should be positioned to watch for line violations along the end line even if he/she must move to avoid interfering with a server who serves near the left sideline. He/she must be ready to observe the sidelines and net antennas the moment the ball is contacted on the serve. After contact of serve, the line judge should quickly resume original position. 2. If the server serves from the left third of the service area, the line judge on the serving team’s side shall move directly back and in line with the extension of the left sideline, out of the peripheral view of the server, until the ball is contacted for serve (dotted line on diagram 2 below). Then the line judge quickly moves back into position at the intersection of the end line and left sideline. 20 3. 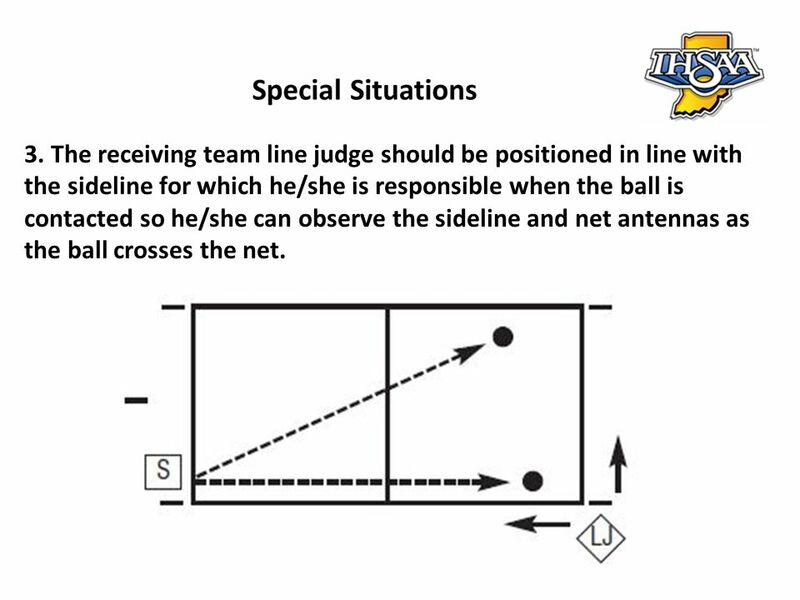 The receiving team line judge should be positioned in line with the sideline for which he/she is responsible when the ball is contacted so he/she can observe the sideline and net antennas as the ball crosses the net. 21 1. Obtaining First Referee’s Attention: Wave arm overhead to obtain the first referee’s attention, when necessary. 2. Inbounds: Arms extended in front of body, hands open (palms down) toward the floor area between the attack line and the net. 3. Out-of-Bounds/Antenna Violation: Hold forearms in front of chest, hands open (fingers together) and palms toward face. 4. Ball Touched: Hand on offending team’s side held beside head, palm toward head, then brush upward across fingertips one time with other hand, palm forward. 5. Line Violation: Indicate the line where violation occurred by extending arm and pointing toward the line with the index finger. 6. View of Play Blocked: Cross forearms in front of chest, palms facing the body. Download ppt "VOLLEYBALL OFFICIALS EDUCATION PROGRAM." What You Need To Know. Definition Unsporting conduct includes actions which are unbecoming to an ethical, fair and honorable individual It consists of. Take Part. Get Set For Life. 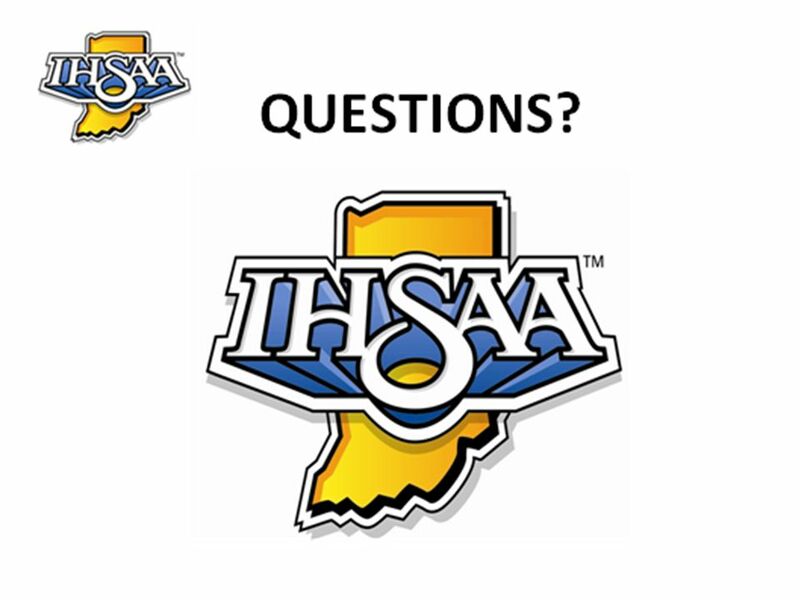 IHSAA On-Line Rules Meetings Instructions 1.View this presentation in its entirety. 2.Take the short quizzes that are placed. A libero is: A back row player Only one libero can be designated per set, but another can be redesignated between sets May be the team captain May be used. Jump Ball. Video Warnings and Delays Throw – in Plane Violations The opponent of the thrower shall NOT have any part of his/her person through. 1 Originally created by Malissa Williams, revised by Tom Craig Adapted by Al Cleary (Used with Author’s Permission) Version Jul 13. What You Need To Know.  A serve is a contact with the ball to initiate play  The server shall hit the ball with one hand, fist or arm while the ball. Used with permission of NFHS. © All drawings and descriptions are the copyrighted property of the National Federation of State High School. What You Need To Know. Team Benches All nonplaying team members, including assistant coaches and other team personnel, shall be seated on the designated. 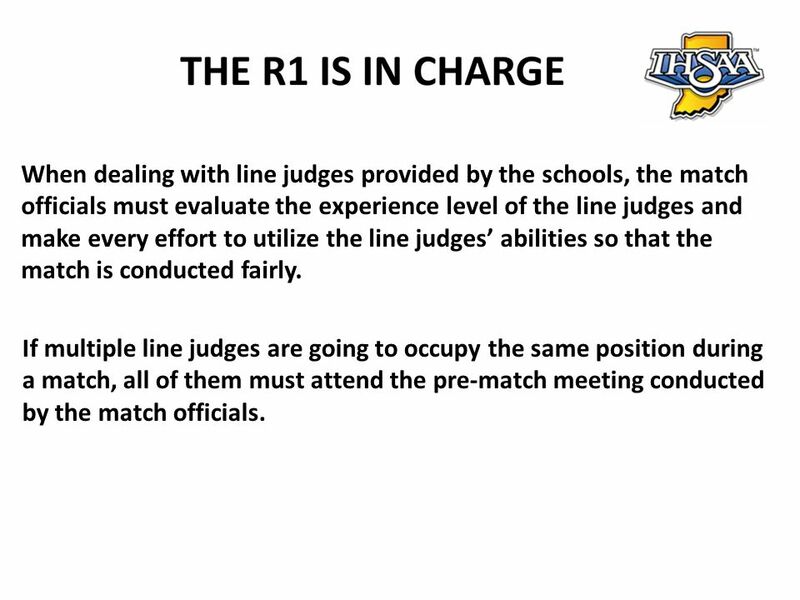 1 Rules 1-3 Created by Al Cleary 20 Jul An interactive MS Office PowerPoint presentation developed by Al Cleary This presentation is best viewed. 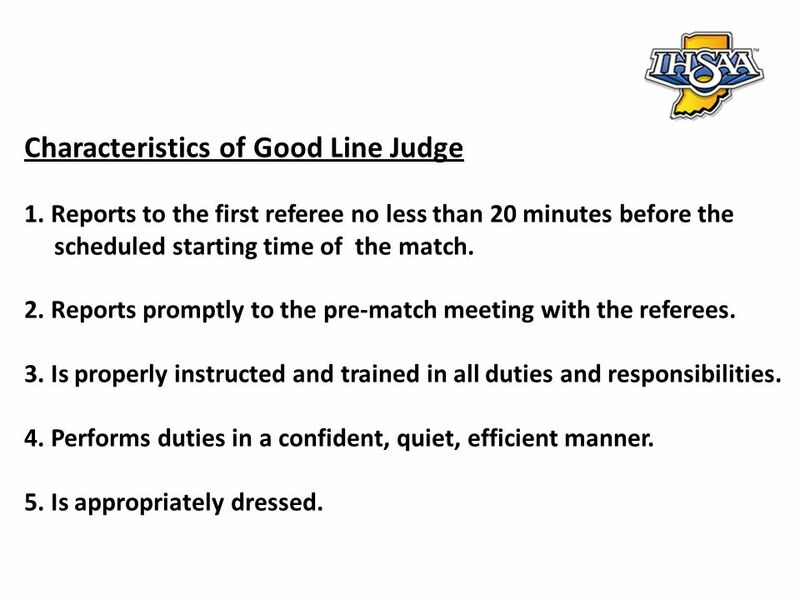 Prematch Conference Procedures for the First and Second Referee. SAOA VOLLEYBALL TRAINING ILLEGAL ALLIGNMENT DEFINITION Rule 6-4-3-a At the moment of serve all players, except the server, shall be within the team’s.